So this book shows a little black girl growing up in America. It has her raising her hands up for various things in her life. Greeting the sun, playing peek-a-boo, getting dressed, stretching to reach something on a shelf, using the sink, holding her hair back, swinging on her mom and dad's arms, raising hands in class, reaching for the book on the high shelf, going into fifth position in ballet, riding a bike with hands in the air, accepting help when she falls, raising her hands at a concert, So this book shows a little black girl growing up in America. It has her raising her hands up for various things in her life. Greeting the sun, playing peek-a-boo, getting dressed, stretching to reach something on a shelf, using the sink, holding her hair back, swinging on her mom and dad's arms, raising hands in class, reaching for the book on the high shelf, going into fifth position in ballet, riding a bike with hands in the air, accepting help when she falls, raising her hands at a concert, in defense playing basketball, raising a trophy in triumph, giving high fives.This all culminates with her being a teenager and raising her arms in protest.THE ENDTHE GOOD - Love the positive, warm family shown in this book. Grandma doing Viv's hair, mom and dad playing with her. - I like how it shows strong community. - I like how it shows different slices and ages of Viv's life.THE BADI'm not sure you can divorce the phrase, "Hands up!" from what is going on in BLM today and the phrase, "Hands up! Don't shoot!" being so prevalent and scary right now. I know what McDaniel is doing,For many people, the phrase "hands up" brings forward difficult emotions like anger, sadness, frustration and fear. With this story, I wanted to emphasize the ways I've experienced that phrase as part of my everyday life: at home, at play, in church, and at protests with young people leading the way.I understand what she's saying, but I think it's hard for any adult to read this book to a child without a horrible sinking feeling in their stomach - I know it was in mine. The child won't know anything, but as an adult it's pretty depressing. Something to consider if you are going to be reading this to children.TL;DR I'll leave it up to you to decide whether this book makes you depressed and if that's a consideration in reading it to children. I couldn't stop thinking about the child(ren) I was reading to growing up and getting shot to death, so... the book wasn't worth that to me. You could say, "Oh, but that's good you felt that way! People should feel terrified and then do things to change the world!" but I don't need help being terrified for both people now and future generations, so... this is just a little sprinkling of depression I'd rather not have. Just my two cents. A delightful and beautifully crafted book that celebrates all the joyful ways to have your Hands Up! This is a much needed reminder (and counter story) to the negative and usually less than nuanced single narrative of the phrase Hands Up! A positive portrayal of being told to put your "hands up!" --singing in church, getting dressed, fixing hair, 5th position in ballet ("graceful like Ms. Misty"), playing defense in basketball, and high fives. Last page shows everyone with hands up at a rally holding signs that say, "Black Lives Matter," "Water=Life," and "Ningun ser humano es ilegal." Not many words on each page--short and simple. Would be great for reading to a group of children as they could put their hands up for each action. A positive portrayal of being told to put your "hands up!" --singing in church, getting dressed, fixing hair, 5th position in ballet ("graceful like Ms. Misty"), playing defense in basketball, and high fives. Last page shows everyone with hands up at a rally holding signs that say, "Black Lives Matter," "Water=Life," and "Ningun ser humano es ilegal." Not many words on each page--short and simple. Would be great for reading to a group of children as they could put their hands up for each action. Digital mixed media for the illustrations--looks like boxy, crayon-ish drawings that are bold and simple. This is perfect for social justice displays for the little ones. Hands Up is learning, growing, and reaching. It's praise, it's perseverance, it's love. Wonderful, colorful illustrations with a beautiful depiction of family, achievement, and self-confidence. This picture book has captured my heart, and I can't wait to share it with everybody! Audiences young and old will adore Hands Up. Lift your hands in joy and celebration! This book helps students see how important their voices and lives are. Its sure to be a favorite for adults and kids. Thank you #BookPosse for the early read. 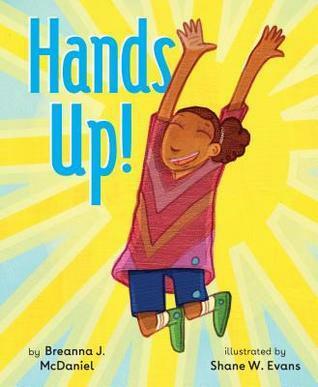 There is hidden power in this book, reclaiming the act of "hands up" and putting a positive, joyful spin on it. Shows all the ways a young black girl raises her hands during her life--getting dressed, ballet class, basketball, and protests are some examples. A beautifully illustrated book. Don't miss the author & illustrator notes at the end that explain the deeper meaning behind this book. This beautifully illustrated children's book celebrates the joy and exuberance of the main character's (Viv's) daily life. The story provides an uplifting take on the phrase, "hands up," and offers a reclamation of those words. The illustration style is colorful and jubilant, and the message is a positive one for any young reader (or pre-reader). This book is a celebration! HANDS UP! for all the good things, for reaching new heights, for trying but needing help, for protest, for sustenance, for love and respect. And don't miss the author's note at the end. Read it and then reread it. Highly recommended for ages 3-6. This book is positive, powerful, and a platform to have a discussion with children about resistance and social activism. This book. THIS BOOK! What a gorgeous story. A lovely, affirming book about stretching our hands up. Wonderful children’s picture book! Very proud to read it with my daughters! !